Can’t wait to feel better? Head to CNOS Orthopaedic Urgent Care in Dakota Dunes for the care and attention you need to recover from your injury—without an appointment. Please note that we are not able to treat head injuries that may require emergency care like trauma from motor-vehicle accidents or concussions. Since this is an outpatient facility, we do not store emergency medical equipment like narcotic medications, IVs, or materials for complex sutures. If you come and need these services, we may send you by ambulance to the ER. If you’re not sure, you can call us at 605-217-2667. CNOS offers urgent care to every member of your family. Our specialists welcome all new and existing patients with bone and joint injuries and conditions. Minors, however, must be accompanied by an adult. Our on-site medical equipment store saves you a trip. You’ll be seen by a medical provider specializing in orthopaedics and sports medicine, for the best level of care. Plus, our facility has on-site rehabilitation, x-ray, MRI, casting services, braces and other durable medical equipment. Same-day, walk-in care gives you fast attention when the unexpected occurs. 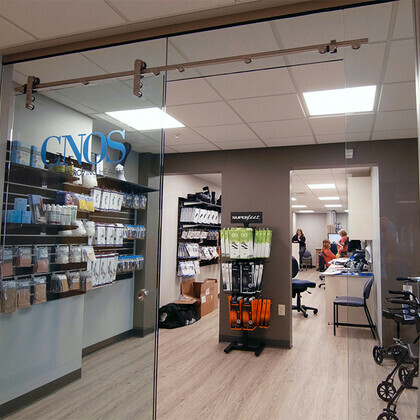 At CNOS Orthopaedic Urgent Care, no appointment is necessary. CNOS, Dakota Dunes offers walk-in care for bone and joint injuries. Stop in or call 605-217-2667 for more information. Can't make it to Dakota Dunes? See if another CNOS clinic can see you today. Request an orthopaedic appointment online at one of our local clinics or call 605-217-2667 now. If you are paying with insurance, certain tests may require authorization from insurance. We always work to obtain this as quickly as possible. If you are not paying with health insurance, a deposit may be required for some treatments.